MSI CloudPM is a cloud-based property management solution primarily targeted at hotels and other businesses in the hospitality industry. The software enables hotel owners and managers to accept online reservations, monitor routine business activities and manage multiple properties using a single web-based interface. MSI CloudPM solution is deployed on the MSI TruCloud facility and can be accessed remotely via any web browser. The software helps property managers to accept guest details for reservation online, check current room availability, allocate rooms to guests and automate billing process based on the number of services consumed by the guests. The activity dashboard provides real-time updates on guest activities and lets businesses manage accounts receivable, direct billing activities and other front desk activities. Managers and admin staff can switch between multiple work screens and monitor various workflows simultaneously using the intuitive navigation bar. MSI CloudPM offers a flexible quotation builder tool that helps hoteliers generate fresh quotes for rooms according to their current availability and demand. The inbuilt Tape Chart feature offers a complete view of all pre-booked reservation activity by room. The solution is capable of integrating with partner CRS, CRM, revenue management and other third-party applications using a universal interface connector. MSI CloudPM also provides a web-based instructor-led training mode that allows businesses to execute and manage staff training programs across multiple sites. MSI CloudPM is designed to meet the requirements of hotels with 12 - 600 rooms and has customers across North America, Europe and Australia. Some of its customers include Best Western Inn, Grande Prairie, Livingston Manor and Liberty Lodge. I have installed CloudPM in about a half dozen properties. There have been many benefits to the software such as intuitive design which saves on labor, a modern menu system that is easy to navigate and great reporting. I also appreciate the installation process including the handling of credit cards PCI compliance. Many other PMS systems require you to go to a 3rd party for your Gateway which can cost in upwards of a month. CloudPM has this included in the system. When marketing to your customers CloudPM has a great feature that allows you to export your guest's data including emails to an excel or cvs file. We use this on a daily basis which has yielded increased revenue to the property. Revenue Mangement, when changing rates on the fly, CloudPM offers a daily rate manager that you can change rates throughout the day if necessary with ease. In summary, CloudPM offers all the modern features you would come to expect in today's PMS systems at a reasonable price. Ease of use, reporting and pci compliance. Ease of use, reporting and pci compliance. not connected with site minder or other channel managers. Silverlight needs to go. Thank you Frederick for your review and comments. We have some good news to share regarding your two "cons": Silverlight will indeed go, in fact upcoming versions of CloudPM will be completely HTML5 compliant which means better browser compatibility (including mobile browsers!) and improved performance. As for channel managers, we recently partnered with Siteminder and you can expect this interface soon. Thanks for using CloudPM! I have always had a great experience with them. They provide great customer service as well.I love how anytime you have a problem, they are always so nice to fix it or if you need help with something they are always very nice about it. I love how easy the system's layout is, it doesnt even require training because it is self-explanatory. I love how anytime you have a problem, they are always so nice to fix it or if you need help with something they are always very nice about it. I love how easy the system's layout is, it doesnt even require training because it is self-explanatory. I hate that it's sometimes very slow to load, or that it freezes a lot. A really quick implementation and they got us up and running in no time! The tech team is great and they are always on hand whenever we need them. The system itself is really nice and easy to use and some of the reporting is good to help with daily decisions, very flexible approach and they can add what may be required. It can be a little slow and this can cause a delay in the task that is being carried out but i must mention this is sometimes the case and in general, it is fine. Thank you for your Capterra review! We're pleased to know that you're happy with your decision to use CloudPM at your hotel and look forward to serving your hotel's needs in the years ahead. Regarding the occasional slowness, if you find that this occurs when performing specific tasks or while in certain areas of the system, please document those occurrences whenever possible and advise our support team. We are always working to optimize CloudPM's performance and our users' feedback is critical in achieving that. Thank you again for being a CloudPM user! Cloud PM, being cloud based was easy to access right from the start of using it and didn't require any set up or hardware from MSI on our end. It is also fairly intuitive so the staff are able to pick up the basics quickly. Being a beta hotel meant that there were some glitches along the way and even though we had to call tech support quite often, every single person has been patient and helpful, going above and beyond to solve the problems, add the requested features and iron out the glitches. I am actually surprised at how responsive our representatives and tech support have been. Many of the features and reports we have asked for have been added during the various upgrades and we appreciate how well they listen to our needs. One of the frustrating aspects was how slow the system was working, often timing out or kicking us out all together. Working with Chris we were able to determine that our PC's just did not have the needed requirements to effectively run Cloud PM. He went so far as to send a computer which has the program working so much faster. We still have the issue of the system randomly kicking us out or having to reboot the computer to reset the print function. But really, compared to where we started in July of 2014, Cloud PM runs almost problem free, we have the features we want, and I have reports that make my job easier. Cloud PM is a great program and MSI is a great company to work with. Contact MSI for detailed pricing information or a custom quote. 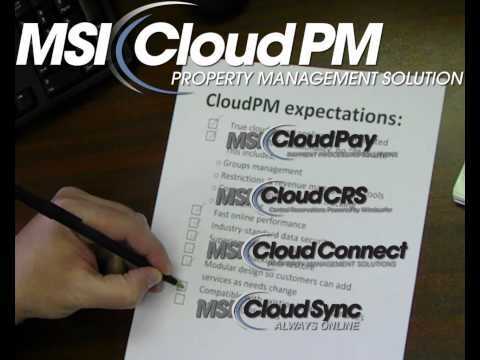 • MSI CloudPM is a hotel property management solution that helps property staff manage front desk activities, online reservations, billing, accounting and other functions. • The solution stores the property data at a centralized location and allows hoteliers to manage multiple properties remotely via internet enabled devices and without dependency on any single system. • The flexible rate builder tool enables hotel managers to customize room rates as per room availability or seasonal demand to increase their profits. • The software helps hotel managers run customer loyalty programs such as reward schemes and loyalty benefits to better engage with their regular clients. • The web-based interface connector allows users to integrate the solution with different third-party services such as PBX and credit card machines to enhance the overall functionality of the connected system. Below are some frequently asked questions for MSI CloudPM. Q. What type of pricing plans does MSI CloudPM offer? Q. Who are the typical users of MSI CloudPM? Q. What languages does MSI CloudPM support? Q. Does MSI CloudPM support mobile devices? Q. Does MSI CloudPM offer an API? No, MSI CloudPM does not have an API available. Q. What other apps does MSI CloudPM integrate with? Q. What level of support does MSI CloudPM offer? Q. Which apps is MSI CloudPM compared to most often?